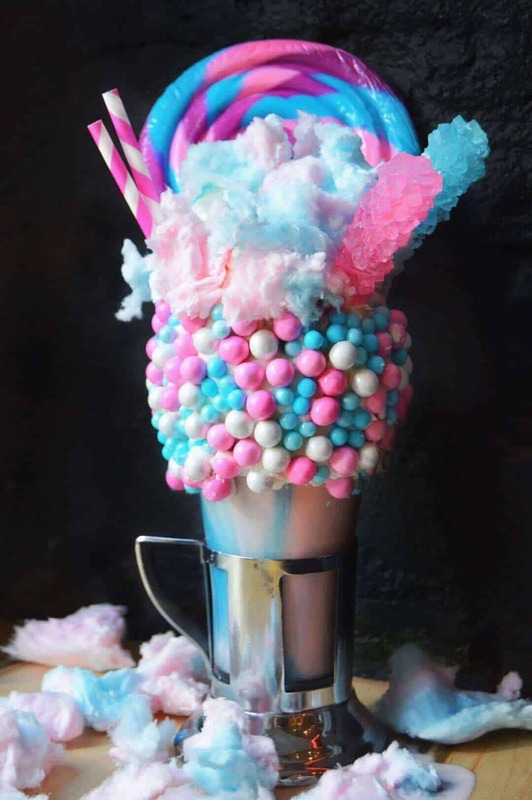 Black Tap’s over the top milkshakes were recently featured by buzzfeed, and have become a social media sensation. To celebrate hitting 100k followers on instagram, they asked if I could make them a milkshake inspired. Preheat oven to 350º F. Prepare three 8-inch cake pans by laying down parchment rounds and spraying with baking spray. Add flour, sugar, cocoa, baking powder, baking soda, salt and espresso powder to a large bowl or the bowl of a stand mixer. Whisk through to combine or, using your paddle attachment, stir through flour mixture until combined well. Add milk, vegetable oil, eggs, and vanilla to flour mixture and mix together on medium speed until well combined. Reduce speed and carefully add boiling water to the cake batter. Beat on high speed for about 1 minute to add air to the batter. Distribute cake batter evenly between the the prepared cake pans. Bake for 25-30 minutes, until a toothpick or cake tester inserted in the center comes out clean. Remove from the oven and allow to cool for about 10 minutes, then remove from the pan and cool completely. While the cake layers cool, prepare the chocolate malt frosting. Beat together the butter and on medium-high speed for a minute. Pour in the vanilla and salt, and beat until combined. Reduce the speed to medium-low and slowly add the powdered sugar, a little at a time, until it has all been incorporated. Add in the cocoa powder, and beat thoroughly. Once the cocoa powder is fully mixed in, add in the ovaline and beat for another minute. Add heavy cream as needed. Increase the speed to medium-high and beat for an additional two minutes, until light and fluffy. Top each cake layer with a thick, even smear of frosting, and stack the layers. Apply a crumb coat to exterior of the cake. Refrigerate for 10 minutes to let the frosting firm up. While the frosting sets, prepare the white chocolate ganache. Place the cream in a microwave safe bowl and heat on high for 45 seconds, until the cream has just begun to bubble. Pour the chopped white chocolate into the cream making sure the chocolate is fully submerged, and let sit for 2 minutes. Begin stirring the mixture in the center, gradually working your way outward until the ganache is completely smooth. Split the mixture evenly between three bowls, and stir in the gel food coloring. Set aside to cool, stirring occasionally, until it has thickened slightly, but is still a pourable consistency. Pour each colored ganache into a thick ziploc bag. Apply the remaining frosting to cake, smoothing it as much as possible. I applied a coat of black frosting, to match the black tap logo and color theme. I then pressed candy drops into the side of the cake. Snip the corner of each bag and drizzle down the sides of the cake, and swirling it on top of the cake. 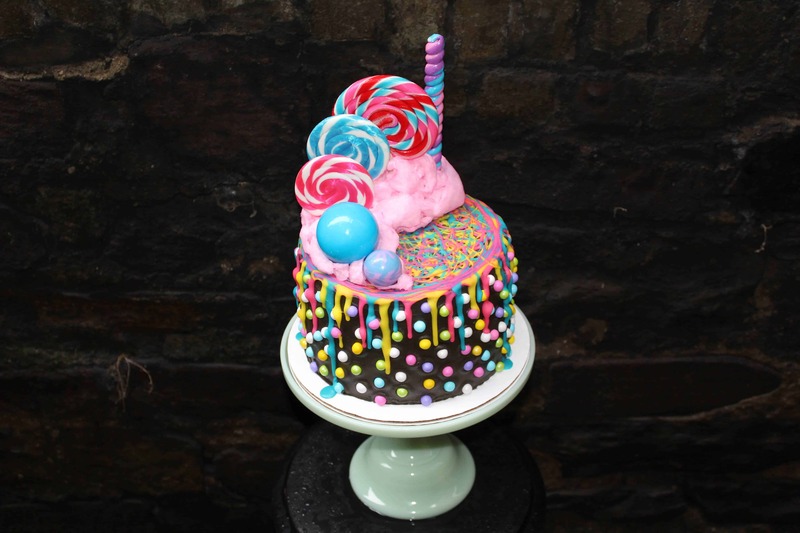 The last step is to stick the lollipops onto the cake, and layer cotton candy beneath them. Luckily I live next to Dylan’s Candy Bar, and was able to find lollipops in the exact color scheme I wanted. Party city also has a great selection of lollis! What an adorable and amazing looking cake! You’re very creative and talented! I just stumbled across your blog–love food blogs and all the great recipes and creative ideas. 🙂 Did you actually eat that cake? And did it taste as good as it looks?! Silly questions but where are the salt and the vanilla in the buttercream ingredients? Also, is it two or three layers? The instructions go back and forth. Hoping to make for my daughters’ birthday this weekend. Just a note. 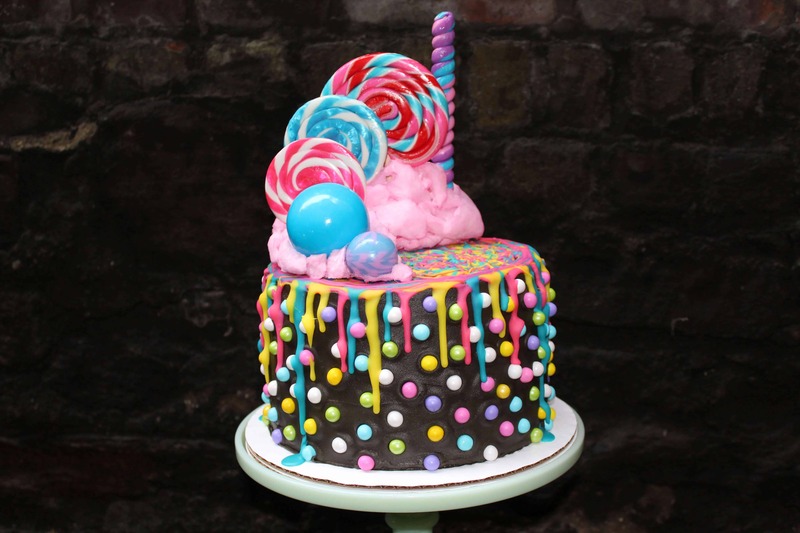 I have used cotton candy on a candy land cake before. It should be put on at the very last minute before serving because it will dissolve if cake is boxed. sadly I’ve learned that the hard way :/ but yes, that is a great note!! !